Synthetic leather. Note the neoprene flex joints with rubberized fingertips that will extend the life of the gloves by two or three times. The flexible spandex and mesh back keep hands cool and comfortable. 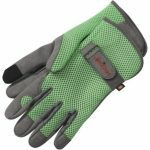 The snug fitting elastic wrist with Velcro closure keeps out dirt out debris.